Inflammation is a process that occurs to protect ourselves from further injury, usually as a reaction to an injury, stress, or infection. Short term or acute inflammation is an important component of our immune systems, to help fight infection or injury. For example; when a person sprains their ankle and swelling results, this is a form of acute inflammation. The immune system immediately responds to the injury by activating certain cellular responses at the site to release inflammatory mediators which will result in increased blood flow and white blood cells to injured tissue to stimulate the healing process. In this example, inflammatory mediators will result in increased sensitivity to pain (to prevent further injury), heat, redness, and swelling to injured region. Acute inflammation is an innate and normal process. Chronic inflammation is an entirely different story and can rec havoc on our bodies in numerous different ways. Chronic inflammation is low grade and systemic, and is often asymptomatic, meaning no presentable symptoms. This process is usually a result of an over-active immune system attempting to fight an underlying problem. Over time the overactive immune system floods the body with defense cells and other mediators that results in damaging tissue as opposed to healing tissue. More often than not this chronic inflammation is a result of consumption of a standard American diet, stress overload, and/or environmental toxins, just to name a few. Determining the cause of the chronic inflammation is vital to address the root cause of the problem. Chronic inflammation isn’t the root cause, something is causing the chronic inflammation which needs to be determined before treatment. Other chapters will discuss factors that can cause inflammation such as leaky gut, oxidative stress, and mitochondrial dysfunction. I mentioned above that inflammation occurs when the immune system is fighting a threat to the body. Possible threats include pathogens/microbes, injuries (like a paper cut), and toxic or chemical exposure the body doesn’t recognize. The immune system uses inflammation in the short term to its benefit which helps repair damaged tissue. 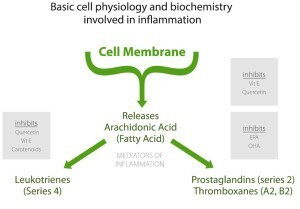 Hormones (bradykinin and histamine) dilate blood vessels in the surrounding area of the inflammation allowing for more blood to reach the injured tissue resulting in healing of the tissues. The cardiovascular system is vital in delivering immune cells to the injured tissue. If the threat is contained or eliminated and the tissue repaired, then inflammation is no longer needed to help the body heal. Chronic inflammation is a complication in the body where the tissues are not healing because of a constant stress. 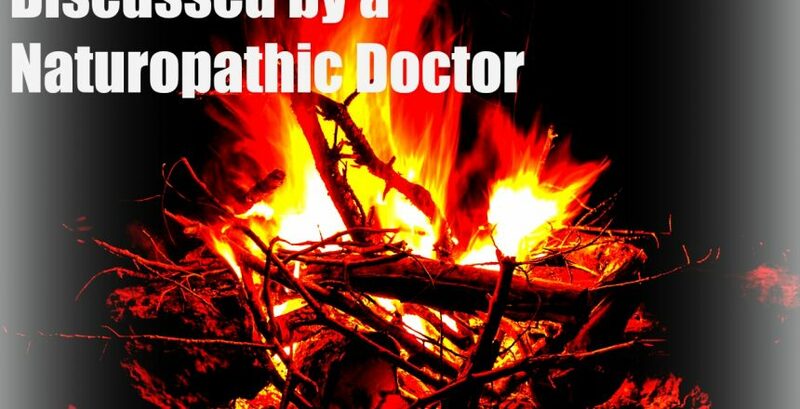 To be able to address the root cause one must determine the cause of the chronic inflammation. Sub optimal fatty acid ratios can lead to a worsening of chronic inflammation. Processed foods are usually loaded with omega 6’s because it’s cost effective to use certain oils to make said processed food. Our livestock are being feed diets high in omega 6 containing grains to speed up time from farm to grocery stores. This process is actually changing the makeup of the livestock we consume at the cellular level. Omega 6’s are perfectly healthy and have a number of different actions in the human body. The problem occurs with the incorporation of including excessive amounts of omega 6’s into the diet. This has led to a dramatic change in the ratio of omega-6 and omega-3 fats consumed. This increased ratio of omega 6’s to omega 3’s has contributed to the epidemic of chronic inflammation. A normal ratio of omega 6’s to omega 3’s is about 1:1 to 4:1. Anything above this ratio has shown to have an inflammatory effect. Guess what the ratio is for the average American? 10:1…… nope, a whopping 20:1. Normalizing levels to a 1:1 ratio can have profound health benefits. Leaky gut aka increased intestinal permeability causes inflammation and is linked to numerous chronic conditions. We discussed leaky gut in the previous chapter, but I’ll give a brief explanation of leaky gut again. Tight junctions acting as a barrier in the intestines become damaged and undigested food particles, microbes, and toxins enter the blood stream leading to chronic inflammation and activation of immune complexes. Auto-immune disease is a self-perpetuating immune reaction that results in tissue damage and inflammation and some theories suggest is caused by “leaky gut”. I only mention this because leaky gut is a cause of inflammation and another connection to chronic disease that isn’t being addressed. Inflammation has been linked to numerous health issues and researchers are currently investigating the role chronic inflammation has on bodily functions. Chronic inflammation can occur for years without you noticing and has been linked to conditions such as cancer, heart disease, diabetes, arthritis, depression, and Alzheimer’s. Other conditions that also have a connection to chronic inflammation include autoimmune diseases, arthritis, inflammatory bowel disease, allergies, neurological diseases, and a number of digestive disorders. 1. Normalize omega-6 to omega-3 ratio by increasing foods such as wild-caught salmon, walnuts, chia seeds, and flax seeds. Avoiding processed foods will also help normalize the ratio as they are usually loaded with oils containing omega-6. Tip: orange color is indicative of increased omega-6’s because it’s farm raised salmon. Dark pink or red salmon is higher in omega-3’s and a good indication it was wild caught. 2. Turmeric is best known as one of the ingredients in Curry, a delicious Indian dish. Turmeric has been found to exert antioxidant, anti-inflammatory, and anti-mutagenic activity. Tumeric has been shown to inhibit a number of different molecules involved in inflammation including phospholipase, lipooxygenase, COX-2, leukotrienes, thromboxane, prostaglandins, tumor necrosis factor, and interleukin-12. Based on its anti-inflammatory properties, turmeric is used as a natural treatment for rheumatoid arthritis, osteoarthritis, endometriosis, premenstrual syndrome, fibromyalgia, and numerous different digestive disorders. 3. Avoiding inflammatory foods is just as important as increasing foods with anti-inflammatory actions. The following (on right) are a few simple suggestions to eliminate from your diet or to consume in moderation as they can contribute to inflammation. 4. Start cooking more with Rosemary and Ginger. These are two powerful botanicals that contain phytonutrients that are anti-inflammatory. Traditionally, rosemary has been used to reduce muscle pain, support the nervous system, and to increase menstrual flow. Ginger is a popular in Chinese medicine and has been used for thousands of years to help digestion, dyspepsia (upset stomach), diarrhea, arthritis, and painful menstrual cramping. 5. Licorice is a plant, but most people know of licorice as a treat found in the grocery store. The candy flavor is usually derived from the plant’s sweet root, but most use synthetic flavoring now a days. The Latin name of licorice is glycyrrhiza glabra and is found in many supplements. The two most important constituents of glycyrrhiza are glycyrrhizin and the flavonoids. With oral ingestion, it is broken down to glycyrrhetinic acid. Glycyrrhizin is anti-inflammatory and inhibits the breakdown of cortisol through inhibition of 5-beta- reductase and 11-beta- hydroxysteriod dehydrogenase.